After a busy week where the team has assisted Dumfries and Galloway Council and Police Division the team received a further call for help on Sunday afternoon. A 64 year old male who lived in a remote location near Eskdalemuir had been cut off with no power by snowdrifts for the last 7 days. He decided to walk out from his house to the nearest village. After trying one route he was stopped by huge snowdrifts so tried an alternative track. Eventually after trying to walk through deep snow for more than 4 hours he was forced to call for help. The team arrived just after dark and attempted to drive towards where we believed the man to be. The team had to abandon their vehicle and proceed on foot. Eventually after battling through drifts for 2 hours two team members managed to reach the man. Further team members followed on and started to trample a path through the snow to assist the man to our team landrover. Once there he was evacuated to the roadside where the Police took over and transported him to Lockerbie. 20 team members turned out to assist with the evacuation. Although they were not all needed in the end, if the gentleman had not been where he was expected if could have turned into a protracted search. 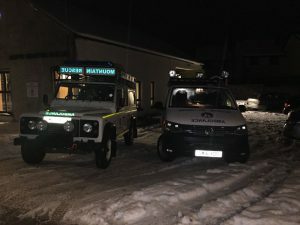 Shaun Duignan, team leader said, “This has been a busy week for the team with many team members working through the night help stranded drivers and then a rescue closer to the expected role of a mountain rescue team, rescuing someone from a remote inaccessible location. The team is pleased to have been able to assist the people of Dumfries and Galloway”.